Concept art from the French zombie film "La Horde"
The Zombie Apocalypse is becoming an increasingly popular pop-culture reference as well as a well-timed allusion to an unsure world. Everything from popular memes to elaborate survival guides harken to the unlikely, but nevertheless terrifying, presupposition that an unknown virus will infect the world's population turning the recently deceased into flesh-hungry undead, endlessly pursuing the living. As Max Brooks, the author of The Zombie Survival Guide suggest, the undead themselves act in a viral nature: they are self-replicating, relentless, and unemotional and that is what makes the threat of a zombie apocalypse so terrifying. They exponentially replicate, they never stop, and there is no way to reason with them... you can only run, and run you will! But where to? We all have seen enough of the zombie genre films to know that there are very few hiding places that the ravenous undead will not eventually get us. The unsuspecting subjects of Romero's Night of the Living Dead retreated to a farmhouse and in Dawn of the Dead a shopping mall. Both proving no good in the long run, though the mall is probably your best bet for a while. The brain munching zombies from Return of the Living Dead trapped their quarry in an active funeral home and that was an epic fail for those unfortunate victims. Or, in more recent memory, the heroic gang of AMC's The Walking Dead has holed up in an abandoned prison with various ups and downs that go to show there really is no totally safe refuge. This brings us to yet another underlying, albeit psychological, effect of being a survivor of the zombie apocalypse: The built world, and particularly our homes, retail stores, municipal building, and even places of worship, are all equally susceptible to the surging hordes of flesh-eaters just outside. It presupposes that our most intimate spaces, the personal spaces that we retreat to and the social spaces we venture to, the ones that make us feel human and free and safe, no longer offer the same mental and physical solace. In fact, they become just the opposite: a prison where the only option is a horrible death at the hands of cannibalistic ghouls, crazed humans, potential dehydration and starvation, or even ourselves. The thought of being trapped in the buildings that serve us in our normal lives, the structures that are created by us and for us and our quality of life, is quite unsettling and it turns the security and civility of Architecture on itself where our homes and stores, our churches and courthouses become our hiding places, prisons, and, inevitably, our crypts. If you would like to read more on how to fortify your domicile against the zombie hordes check out this link! If you are in the market for a new home and want it to be zombie proof check out this link! 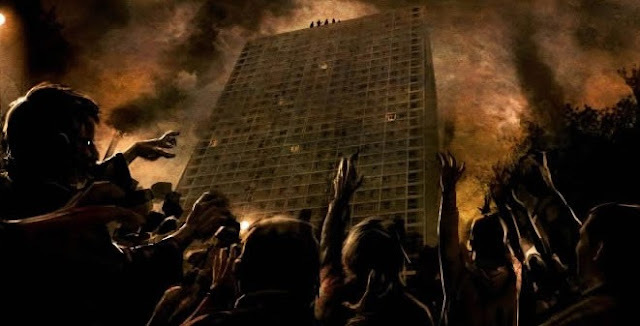 And if the musings here are not enough mental stimuli and you want to read Sam Jacob's argument against the concept of "zombie architecture" and the often misplaced nostalgia of resurrecting historic buildings, check out this link! Happy Halloween from Urban Times!! !